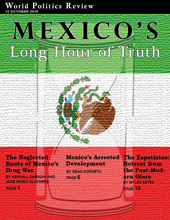 Mexico's drug-related violence has attracted worldwide media attention. Yet the underlying causes of the crisis have often gone unexamined, as have the other challenges the country faces. Torn by violence, trapped by the economic pull of NAFTA, and gripped by persistent social inequalities, Mexico has seen its stature diminished. While the rest of Latin America makes great strides forward, time seems to be standing still for a country that was once the intermediary between America and the region. Subscribers can download Kindle and PDF versions of this feature from the links on the top left of each component article's page (linked below). Not a subscriber? Purchase this document for Kindle or as a PDF from Scribd, or try our subscription service for free. Mexico's present crisis with drug-related violence is rooted in persistent aspects of Mexican government and society that long preceded the emergence of the cartels as a serious national security threat. Until the underlying issues feeding the drug cartels' expansion are addressed as part of a more comprehensive strategy, we are unlikely to see meaningful progress in this war. Long before Facebook, the Zapatistas became the first group to use Internet-based social networking as a means of fomenting radical social change. Sixteen years later, Zapatistas are indigenous peasants, living by simple means on land they seized during the 1994 uprising. Paradoxically, perhaps, this is what the world's first "postmodern revolution" aimed at: the right to live and work as rural farmers. In his 1996 classic, "The Clash of Civilizations," Samuel Huntington characterized Mexico as a "torn country" -- a condition produced by the Westernizing instincts of its elites pulling against the weight of its cultural heritage. Today, however, Mexico is not torn by internal discord, its drug violence notwithstanding. Rather, it is trapped -- caught between dynamic global trends washing over Latin America on one hand, and the dogged political realities of North America on the other.